Loren Smith has been in love with Eliot Devlin almost his entire life. During their turbulent childhood and teen years, Loren didn’t always understand Eliot, and sometimes he could be a challenge, but Eliot was the only one to ever truly ease Loren’s deep loneliness and accept him. When Eliot’s increasingly erratic and self-destructive behavior culminates in a suicide attempt at seventeen, Loren is devastated. Upon meeting again by chance nine years later, Loren is enjoying a successful career as a police officer while Eliot’s life has been a constant struggle for stability. In and out of mental hospitals, with a rap sheet a mile long, he continues to be buffeted by the twin storms of mania and depression. Loren’s love and protectiveness for Eliot are deeply ingrained in him, however, and their feelings for each other are quickly rekindled. Loren has issues of his own he’s dealing with, and trying to understand and cope with Eliot’s bipolar disorder isn’t easy. They believe they’re meant to be, and Eliot brings a fulfillment to Loren’s life that no one else will ever match. But as they both come to realize, love by itself can’t cure all. So, I absolutely LOVED book 2, but this one, I struggled to get through. I don't know that I would even truly categorize this as a romance. It's more about watching two lives come together, rip apart, and come back together. It has a very real quality to it, but for me, it was just too long. While I can understand getting the reader to feel Eliot's cycles, after a while, I found myself skimming along. Loren and Eliot grew up together. Eliot was always there for Loren and vice versa. However, as the boys grow older, Eliot becomes a little more "weird" and Loren takes notice. Despite trying to help his friend, it all becomes too much for Loren one night. Eliot cycles through his mental health issues throughout this story and while it's real and complex, emotional and honest, I felt that this book was all about his issues. Loren watches and feels helpless a lot of the time because he's constantly worrying that something will set Eliot off in to another cycle. It's hard to watch this relationship – at times, it's like watching a train you know is going to collide, but being unable to look away. So, while I did think that the book offered a very honest look at the life of someone with a mental health disorder like Eliot's, it was just too much for me. Melanie Hansen has spent time in Texas and Florida prisons… for work. She’s been in a room with a 17-year-old mass murderer who was also one of the most soft-spoken and polite teenagers she’s ever met. After a 13-year career as a court reporter, she can tell many stories both hilarious and heartbreaking. 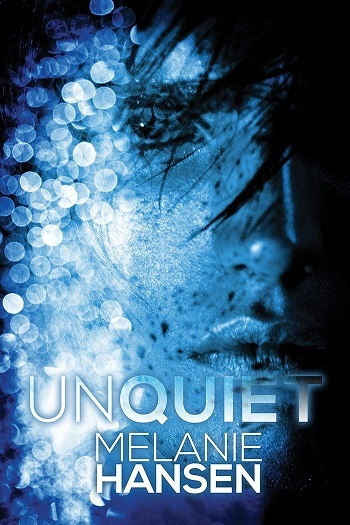 Reviewers on the Wicked Reads Review Team were provided a free copy of Unquiet (Resilient Love #3) by Melanie Hansen to read and review. I love paperback but the post is so expensive that all my new books are e-books and having e-books on the computer means I can buy how many I want! I like physical books because you can share them, but ebooks are king for me right now because I can afford to buy so many more of them. I like paperbacks but it can be expensive but the bright side is I can skip to the part I like easier by just flipping to the page. Also it's what I'm use to since I grew up with them. Ebooks are more affordable (about the cost of what a small paperback use to be) and easier to store. I love paperbacks, but ebooks make taking lots of books where ever I go much easier. I love paperbacks but it's not easy to find mm ones where I live. Ebooks are way easier. I don't listen to audiobooks. ebooks all the way, especially since I live in Indonesia and getting print/paperbacks for MM is a total hassle. I love all the formats; they each have their charms. However, I tend to listen to audiobooks more often than read these days because of commuting and the ability to listen while doing chores/errands. I prefer ebooks mostly, but love to listen to audiobooks in the car. I rarely read paper books. I can't choose between ebooks and audiobooks because I read and listen to them equally but rarely ever read paperbacks anymore. I prefer ebooks because they are easier to read on-the-go. Suspicious Behavior by L.A. Witt & Cari Z.